We’ve had a few recipes for pizza on the grill, but none we really wanted to repeat. Getting the dough right is too difficult – either the dough its too soft and sinks in the grates, or requires great skill to handle. This recipe (from the Strib) uses smaller dough rounds and cooks them on each side. They are easier to handle and taste great. Now we do this whenever its too hot to light the oven. You can top them any way you like, but the crust is tasty and you’re better off going light on ingredients, getting fewer, but stronger flavors. In a medium bowl, combine flour, yeast and salt. Mix together water, honey and olive oil. Add liquids to flour, mixing with a wooden spoon until combined. (In a mixer, use the dough hook). Add additional flour if necessary until dough comes together in a fairly firm, slightly sticky ball. Turn dough onto lightly floured surface. Compared with typical bread dough, pizza dough actually is better if it’s a little undermixed. Knead dough for a few minutes, flouring hands, until the dough is smooth and elastic. 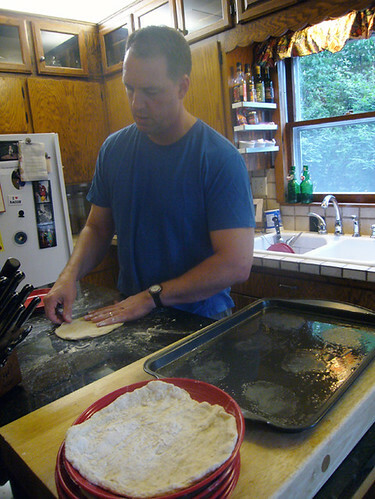 Place the dough in a large well-oiled bowl and turn it so the top is oiled. Cover with plastic wrap and let it rise until it begins to look puffy. Place in refrigerator overnight, or for at least 4 hours. 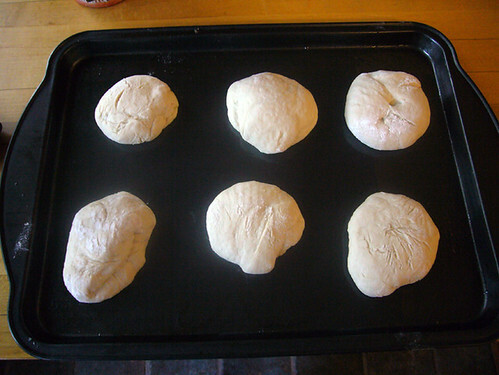 About an hour before baking or grilling, remove the dough from the refrigerator and turn onto lightly flooured surface. Divide into six equal parts and shape each into a smooth ball. Place the balls on an oiled baking sheet, leaving space to expand. Cover them with a dish towel and set aside. Use this time to prepare your toppings. If you’d like some ideas check out this post from last year. As the grill is heating, shape the rounds. Using a rolling pin on a floured surface or with floured hands, stretch each ball into an 8 -10 inch circle and place them on separate sheets of floured parchment or waxed paper. You can stack them. Take the dough rounds, your sauce of choice, and the assembled ingredients outside to the hot grill. Note: it’s easier to handle personal-sized pizza rounds on the grill. Cooking on the grill: Heat your gas grill to medium, or about 400 degrees, if using coals, you should be able to hold your hand 6 inches over the heat for 3 seconds. Move the coals so that they heat half of the grate, to create areas of direct and indirect heat. 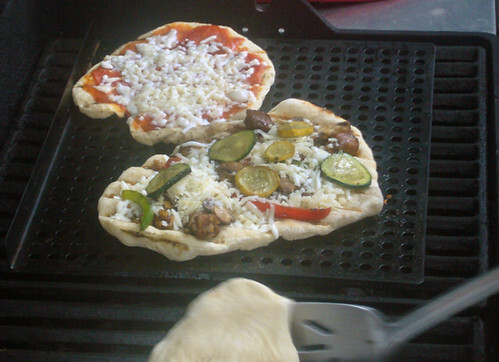 The assembly line approach to making multiple pizzas: Lightly brush one side of a dough round with olive oil and place it oil-side down on the grate directly over the coals. Replace the grill cover and oil the next round. After about 1 minute, open the grill. The first tound should look puffy and have clear grill marks on the underside. Remove it and flip it grilled-side up onto a cookie sheet. Quickly spread it with toppings (lightly is best), then return it to the portion of the grate that’s over the indirect heat. Place the next oiled round on the grate over the coals. Replace the grill cover. After about another minute, open the grill to check on the untopped pizza. If it’s ready, remove it, replace grill cover, then add pizza toppings. 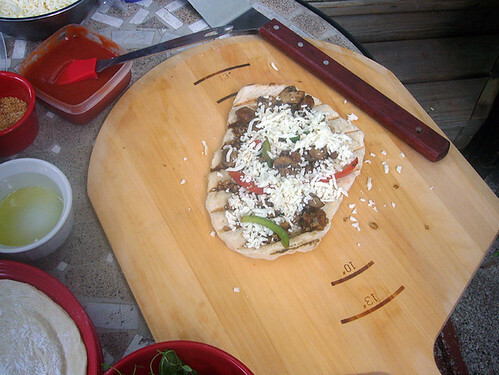 The pizza on the grill should be done by now; if it is, remove it to a cutting board and place the newly topped pizza over that section of indirect heat. Place another oiled round over the coals, maintaining this system of topping and shifting until all the pizzas are baked. Looks delicious!! Great for a casual summer supper. Good tutorial! Thanks! 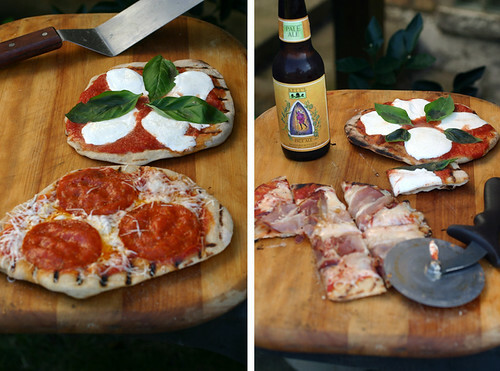 I love Pizza on the grill! I have made pizza on the grill a couple of times and planned to do it tomorrow night. I can’t wait. I have some fresh mozzarella and some turkey pepperoni and heirloom tomatoes on-hand. Your pizza came out great. Smaller size dough is definitely the way to go and make sure it isn’t too thin. You don’t want holes in your dough or the pizza sauce goes right through the grates. Yum! I love the tip about smaller rounds… makes so much sense. I always have trouble flipping pizza on the grill but it would be so much easier with a smaller piece of dough. Why didn’t I think of that? I love the rustic nature of these and the fresh ingredients. I’ve never done pizza on the grill. I know – shame on me. You have some pretty splendid advice – so maybe I shall try – maybe the dough won’t melt into the grate… Maybe. I made this without the four hour fridge rest, only because I didn’t have four hours. It turned out great, but I’m sure the added time would have resulted in a more robust crust flavor, I’ll have to plan ahead next time. The ‘trick’ I’ve been missing all these years is the HOT side and NOT SO HOT side of the grill – GENIUS! Why didn’t I think of that? I’m a huge fan of grilled pizza. Makes for a perfect appetizer or dinner for one or both!